Did anyone hear about this clown’s twitter account? Not one mention of the Royals. Most of his tweets are inane crap about his star sign, quotes about love and relationships and almost nothing about baseball. He should be let go just for that if it’s really true. So, because he doesn’t tweet about his job, he should be fired from it? Does Carol from Human Resources tweet about her job? No? FIRE THAT CLOWN. CAROL DON’T CARE. I was hoping to see something about the initial trade or how his was progressing with rehab, but it’s all crap about being a Scorpio. Reminder: Twitter is a wonderful way for celebrities to break down the walls between them and their fans. HOWEVER COMMA, it is not a requirement that athletes tweet about their injuries, their feelings on a trade, how they played today, their personal goals for the season, how the July heat is going to change their game, the clubhouse chemistry, their working relationship with their coaches, or anything else about their sport. 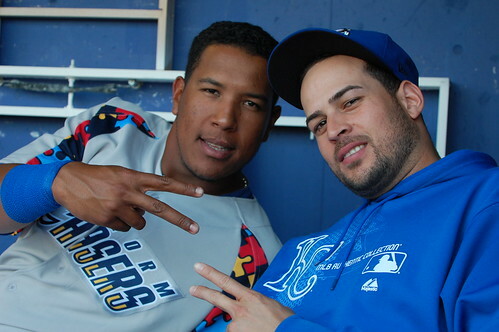 If a Royals player wants to just tweet stuff about the team, that’s neat! Fine! How nice of them to share about their job outside of press conferences. But if they don’t, that’s OK too! It’s a personal account, not a team-mandated exercise in public relations. They choose to share little 140-character bits of themselves with you – follow if if you like it; unfollow if you don’t. It’s simple. Ballplayers aren’t robots built solely for the purpose of baseball. They’re people, and it’s OK for them to sometimes think about things that aren’t baseball. The people who left these comments on the Star don’t know Jonathan Sanchez personally, but they’re perfectly comfortable with diagnosing him as a man who doesn’t care about his job, because he doesn’t constantly tweet about it. I don’t know him either* so I won’t say definitively that the commenters are wrong. Maybe he doesn’t care? I don’t know. But reading his Twitter account is not the way to know, because he’s a human person with a family and stuff, and it’s OK to express thoughts and ideas about them sometimes. *but I did let him borrow my camera one time. And, you know, I’ve had conversations with him, which is certainly more interaction than the armchair shrinks in the Star comments can say. 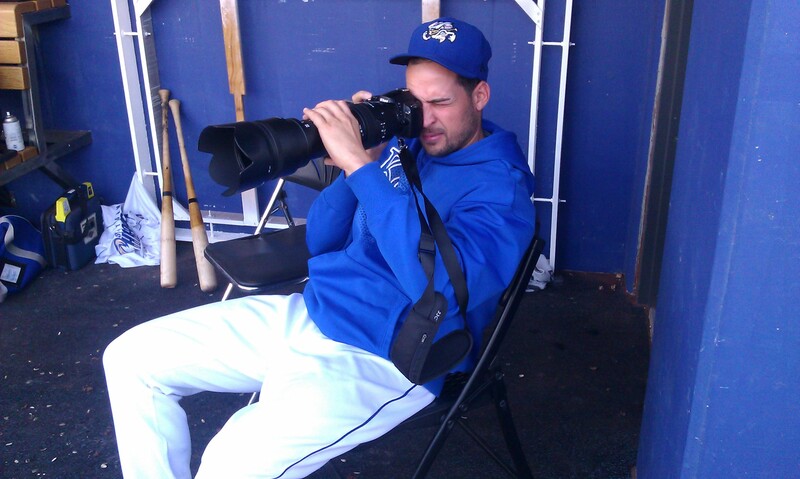 Jonathan Sanchez enjoys trying new hobbies, such as photography. That's my camera. Of course, Sanchez pitched badly today. (I was mercifully not present for those innings. Thank you to my doctor for scheduling an appointment at that time so I was spared from watching that.) I’m not trying to sugarcoat that. But no matter what his postgame comments might be, please remind your neighbors and coworkers that sometimes, people internalize their struggles and not share them with reporters. Failing is hard. Failing in front of a bunch of people is even harder. Having reporters shove microphones in your face after you’ve failed in front of a bunch of people is harder still, I would imagine, though luckily my life’s failings are not scrutinized that way. We might wish for a thoughtful breakdown of every faulty pitch sequence, an admission of shortcoming, and a contrite promise to do better, but not everyone emotes or communicates that way. All of this is to say: Jonathan Sanchez is a human person. So is every other player on the 40-man. They may perform badly on the field, but they’re still people and you probably don’t know them personally, so can we stop with the psychoanalysis? One more picture, just because. Click the pic to see more from Omaha's season. Do MiLB players WANT to be in the playoffs? You are a braver person than me if you read the comments on the Star’s website. I had to go cold-turkey on that about 3 years ago because it made me more fearful than usual about the fate of humanity as well as more hateful towards my fellow persons – neither of which are things I wanna be feeling. And Kathleen’s right. Comments sections on newspaper websites are where the least intelligent members of society congregate.